Mumbai: The felicitation ceremony for the 12th edition of the Fair & Lovely Foundation scholarship program was held in Mumbai today at the St. Regis hotel. The event was held to award scholarships to selected women from across India showcasing outstanding academic records, and awe-inspiring desire to become self-reliant. Noted dignitaries from distinguished backgrounds including actress Lara Dutta, humanitarian Lila Poonawala amongst others were seen talking about their association with the program and supporting women’s aim to break economic barriers and become self-sufficient. The event saw a flurry of activities including enchanting performances by Terence Lewis’ group and versatile singer, Vasudha Sharma which left the audience spell bound. The event ended on a high note with a cake cutting ceremony with the winners and actress Lara Dutta. 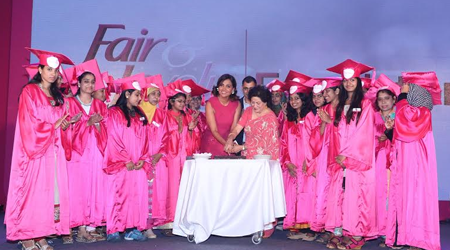 Fair & Lovely Foundation over the years has awarded scholarships of up to rupees one lakh to thousands of deserving women who come from difficult socio economic backgrounds. Women from across India were selected through a screening and interview process. Noted professionals from various fields formed the selection panel and interviewed the girls across five centres: Mumbai, Chennai, Kolkata, Hyderabad and Lucknow, and ultimately helped the Foundation choose the finalists for scholarship.